Last night we spoke about public space being the last stand for democracy. Our first amendment rights protect us, cloak us when we’re in public space. All the cops and logos in the world can’t weigh us down there. Cities need public space. Somewhere where it’s citizens can be human with one another without the pretense of buying something. Somewhere where we can shout at one another, argue, protest, play guitar, have picnics and just generally lounge about. When we’re sharing public space with one another, we can become uncommercialized. We break through the commodity wall together. We talk directly with one another, share ideas that aren’t corporate sponsored or mired in the restrictions around the water cooler at work. Most importantly, we make change together. 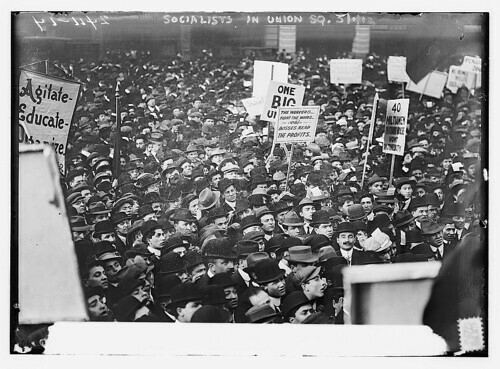 In the pavilion of Union Square alone, the voices of Emma Goldman, Paul Robeson, Dorothy Day, Caesar Chavez and so many others echoed while thousands rallied around them. Women won the the right to vote there. We fought for the 8 hour work day there. We grieved there. We rallied there. Together. More and more what we’re seeing is that the cops and logos are encroaching on our public spaces. Even the language of public space is changing. The word “mall” used to be associated with a public promenade, a commons space. Now we associate “mall” with the epitome of private spaces. If we were to stand up and shout or gather in crowds in these modern “malls,” we would immediately be escorted out by rent-a-cops. The first amendment does not apply there. Corporate advertising also continually invades our public areas. I spoke to Jordan Seiler from the Public Ad Campaign, a group that seeks to take back public space from advertising by doing unauthorized art installs on and over ads facing public streets and sidewalks. Jordan spoke of the need for the people to take public space back for themselves. There is this myth of acceptance out there – the belief that we have no choice but to deal with the thousands of advertising events we see the minute we step outside. As Jordan and his group prove, we don’t. The same myth of acceptance is there when the line for the Shake Shack at Madison Square Park goes around the block. It’s also there when we just walk by the fenced-off pavilion at Union Square without shouting “Hey! That’s ours!” We don’t have to accept the privitization and militarization of our public spaces. We need assert our need for them. Join up with groups struggling to save our public spaces. Protect these temples of free speech! For my debut show I’ll be talking about public space: why it’s important, how it effects us, and how it is becoming increasingly privatized. Featured will be two sermons by Rev. Billy about public space as an arena where we can exercise our first amendment rights freely and without fear (although increasingly less so). I’ll be interviewing Jordan Seiler of the Public Ad Campaign, a group that does unauthorized public art installations over ads in public areas and spaces.